Work faster and more efficiently by using your keyboard instead of your mouse. HotKeyz helps the user to work more efficiently and productively. HotKeyz is a shortcut utility with shortcut control for executing other files, folders or RUN commands. The shortcuts work with the WIN, CTRL, ALT, SHIFT modifier keys and most other keyboard keys. You can even enable or disable unwanted hotkeys without deleting them from the hotkey list. Categorise all your hotkeys. Print preview and then print all your hotkeys. 1. Download hotkeyz launcher & install the program. 2. It sits on the system tray, click icon to open it. By default it loads shortcut keys to access different program and feature like for internet explorer, control panel. 3. Click on “New” button, then select any file or exe program file and assign shortcut key. In this way you can assign hotkeys to other programs on your computer. 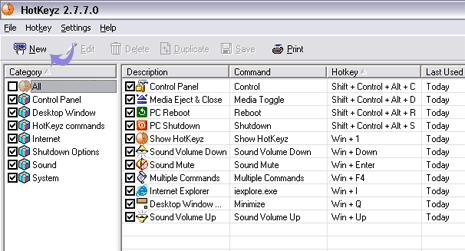 Program window shows how many times a specific hotkey was used. You can also print list of shortcut keys within the program for easy and quick recall. Besides this, you can check other free utilities to add hotkeys to change power schemes, hide taskbar, mute or change volume.